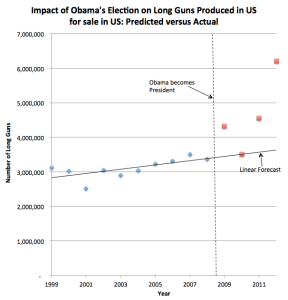 Gun sales have exploded under the Obama administration even while crime rates have fallen. Jason Riley has recently made that point in the Wall Street Journal. 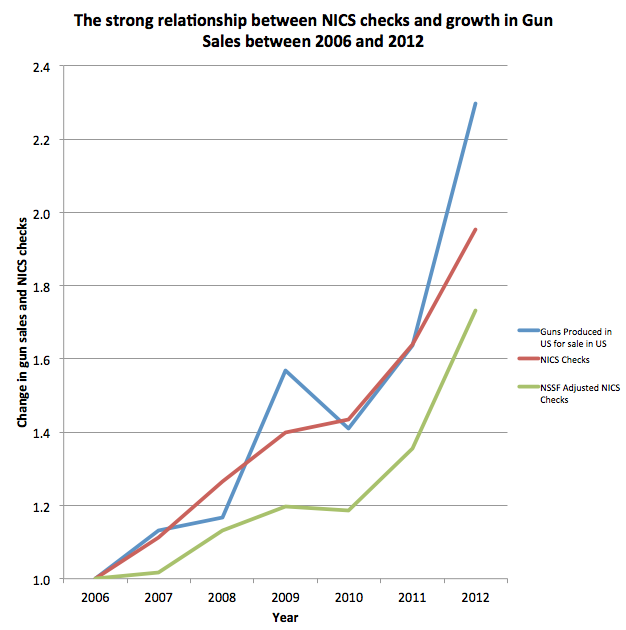 NICS checks for guns are a rather imperfect measure of gun sales. People can buy multiple guns with one sale. NICS checks are also inflated because they are used by states to periodically check concealed handgun permit holders. 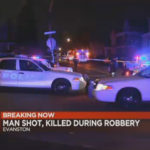 On the other hand, they may face NICS checks when they buy used guns, purchases that merely transfer ownership and don’t increase the total number of guns in circulation. 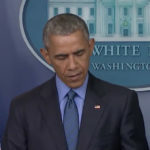 Fortunately, the BATFE also puts out data on firearms manufactured in US as well as US firearm exports — thus one can figure out the number of firearms manufactured in US for sale in the US. Imports of guns into the United States are small, but if I can get numbers on those imports, I will redo these estimates to include them. 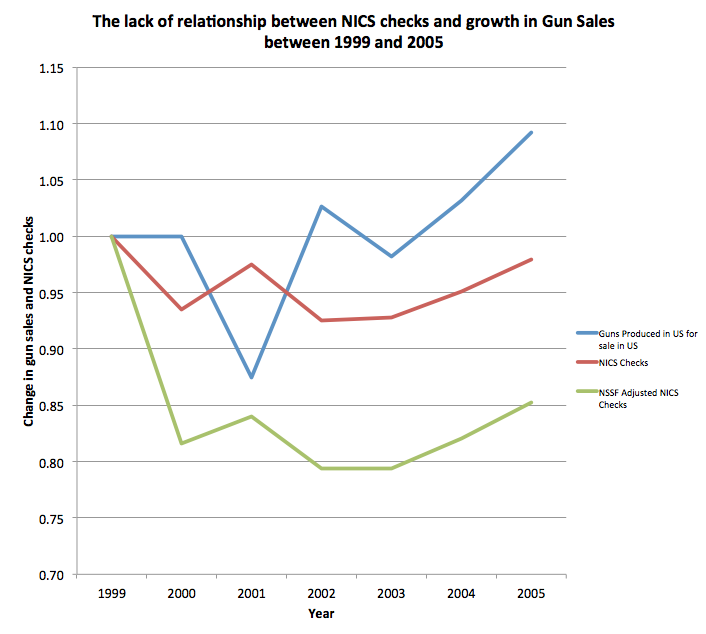 First, it is interesting to note that there is no relationship between NICS checks and gun sales for the first 7 of the 14 years of data. 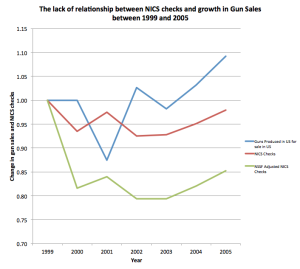 Indeed, from 1999 to 2005 the correlation coefficient between gun sales and NICS checks is actually slightly negative (-0.0595). During that time both gun sales and NICS checks were little changed, with NICS checks actually fell slightly from 9.1 to 8.95 million and new gun sales rising from 4.7 to 5.15 million. However, after that the explosion in gun sales is so great that it overwhelms the errors in the data and it creates a strong overall correlation during the entire time period (0.9794). 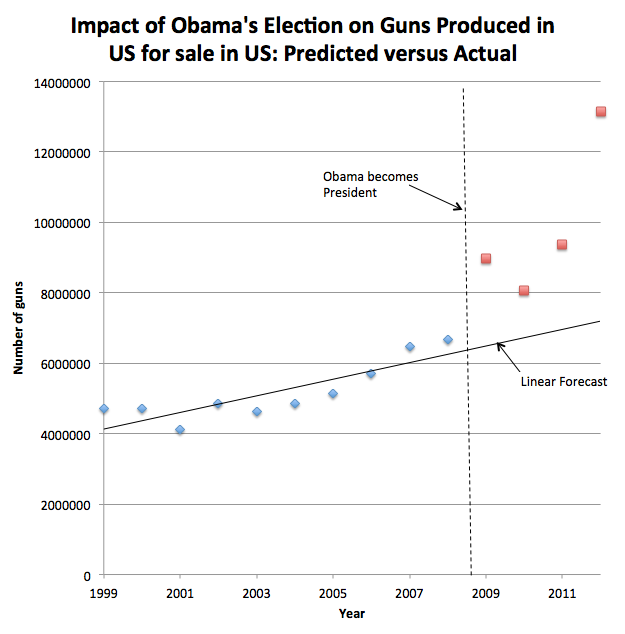 What seems to be happening is that when gun purchases are relative constant as they were in the years from 1999 to 2005, the errors in the NICS data are large relative to the changes in purchases. But even that relationship is misleading. 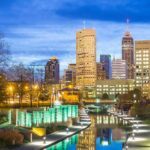 About 52 percent of the total increase in NICS checks for the entire country in 2006 and 70 percent of the total increase in 2007 were due to the increase in just one state, Kentucky. Even 25 percent of the national increase NICS checks was due to Kentucky. 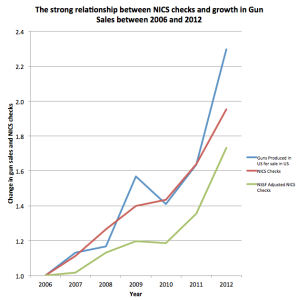 The NSSF adjustment takes that into account, and that measure shows no relationship between the NSSF measure and new gun sales up through 2007 (see below). 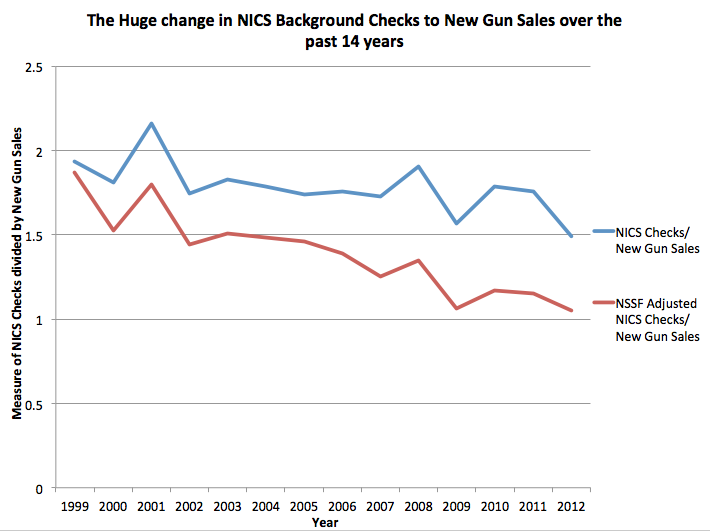 What should be a concern for anyone using this data is the large difference in size between the NICS data and new gun sales and how that difference changes over time. 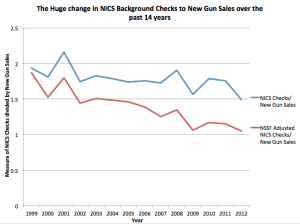 The adjusted NICS checks fell from being 1.9 times greater than new gun sales to being only 5 percent greater than new gun sales. 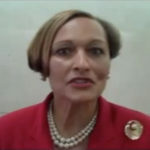 The NSSF puts together its own adjusted measure of NICS background checks that subtracts concealed carry permit applications and state checks on their permit files from the federal NICS numbers as they do not deal with a firearm transfer, but surprisingly they appear to be even less closely related to the BATFE numbers. 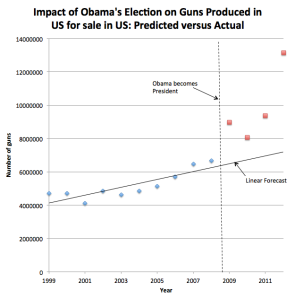 So what happened to gun sales after Obama became president? 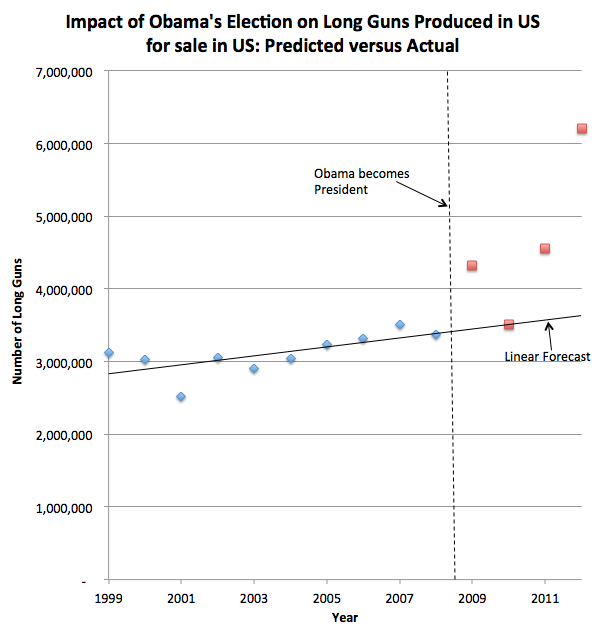 Obama’s election as president had a noticeable increase in gun sales, with sales increasing much faster than one would have predicted using either a linear or exponential forecast model (the later isn’t shown but was essentially the same as the liner one). In 2012, the gap is huge between what actual sales were in 2012 and what they would have been if they had kept growing at the same rate as before Obama was elected. 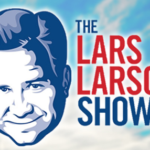 It is also possible to breakdown the sales growth by handguns and long guns. After 2008, the growth in handguns was somewhat greater than the growth in long guns (107% to 84%). 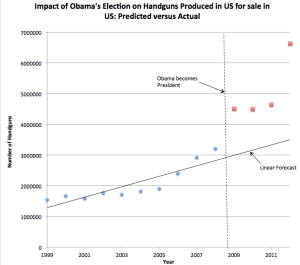 Whether one assumes linear or exponential growth, both handgun and long gun sales have increased relative to what they would have been if Obama hadn’t been president. 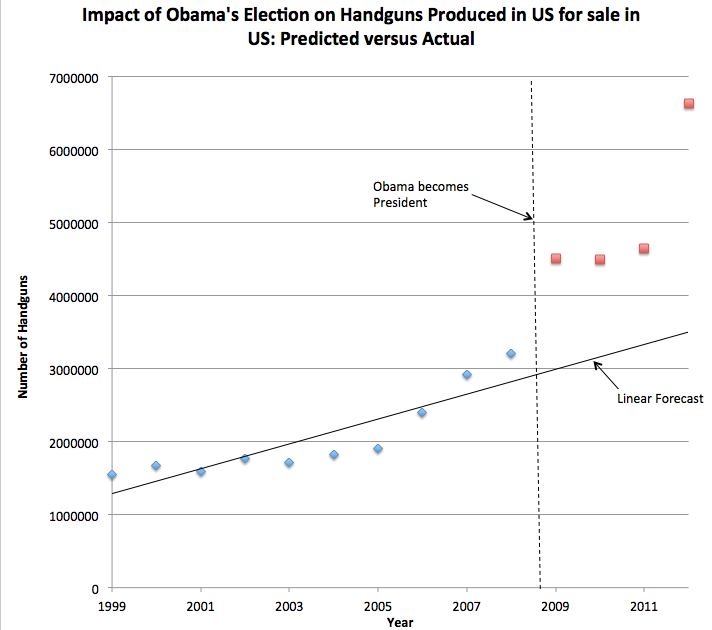 BATFE data on gun sales: 2004, 2005, 2006, 2007, 2008, 2009, 2010, 2011, 2012, 2013. Information on imports and exports is available here. The NICS check data for this period is available here and for the monthly totals by state here.